In the past I’ve had a love/hate relationship with Valentine’s Day, but now that I have kids, I’m in a major ‘love it’ phase. 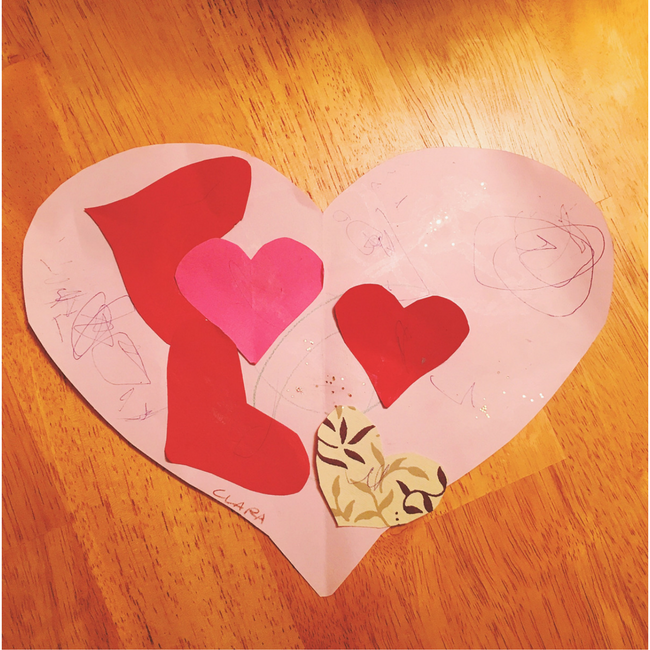 I loved creating little valentines for their friends and I loved the craft Clara made at school and I loved that Clara was so excited about the whole thing. Valentine’s Day morning I had such high hopes… Tim was going to take a few hours off work so he could stay at home in the morning and make heart-shaped pancakes for the girls. And they were going to be pink! We had it all figured out! Well, in true Tim & Lisa fashion, we didn’t really plan ahead. The heart-shaped cookie cutters (that I swear we own) were nowhere to be found, and the food dye was too light, so we ended up with regular-colored start shaped pancakes instead. Wah wah. Clara and Isabelle still loved them so I’m considering it a win. Clara is so proud of her (first handmade) Valentine’s Day card! Tinybeans. If you have a kid and are not using this app, I think you are doing it wrong. I just went through all 2.5 years of pics I have on it (starting with Clara’s birth) and was in tears by the end. Download this one. The concept of minimalism. I am not yet a minimalist, but I am actively working on it. The newborn baby phase. Am I the only person who loves this phase? I might be. Mountains. I had always wondered if living in a place with mountains would make me immune to their beauty… and I can say that after 18 months, the answer is still, nope! And Valentine’s Day wouldn’t be complete without mentioning my husband and our two girls! I love that Tim is silly, kind, generous, and loyal. I love that Clara is independent, smart, goofy, and joyful. I love that Isabelle is squishy, determined, resilient, and cuddly. And (because self-love is important, too!) I love that I’m intentional, witty, motivated, and friendly. I hope you had a wonderful day celebrating love! This entry was posted in about me, currently, favorite things, holidays and tagged favorite things, holidays, valentines day. Bookmark the permalink. Snapchat is the bombdiggity. Pretty sure I didn’t know what I did before the deer filter filled that squeaky voice/pretty eyes shaped hole in my life. Ohmygosh, you’re so right. Although Clara misses the bee. I love this! My bff has two babies and uses Tinybeans. I love waking up to emails with all their pictures! Tinybeans is the best! I love that some of my friends use it, too. And you bring up such a great point about stars… when I’m in places I can see them it’s MAGICAL. You hadn’t been there before?! And I’m glad that the mountains will never get old – I LOVE THEM. This is such a sweet way to celebrate Valentine’s Day! I’m with you on a lot of your loves too. Can I PLEASE have Olivia’s wardrobe? What do we have to do to make this happen?! Win the lottery? Bribe a costume person on set?! There have to be options! oh my gosh, I LOVE doing our taxes as well!! YES! I feel like you could write my Valentines for me 🙂 I don’t know what Chocolati is, but I’d sign up blind as this point. Also, NYC just opened a raw cookie dough place that is safe to eat (you know, no raw eggs) and I haven’t been yet, but it’s high on the list. Happy love week, month, year… who needs a day for this? Ohmygoodness there is a raw cookie dough ice cream place in my hometown and I am OBSESSED. It is delicious and I can only imagine the one in NYC will be amazing, too. Please keep me posted!! !